SUJUDE is a group of people who are into gourmet. We often bake&cook while working. We are trying to find better products. If you have any suggestions, please let us know and we will attach great importance to it, because we want to become a professional 'KITHCENER'. Let's talk about this brownie pan. The secret to make pretty brownies is SUJUDE Brownie Pan. We looked for this kind of brownie pan for so long, we have tried different sizes, colors and material, finally we found it best meet our expectations. Honestly, we recommend this for those families of 4-6 people, or you can buy 2 pcs or more. The recipe (We have done before with this recipe, and it is really delicious, the most important is that it is very easy to make brownies)will send via email. If you want to do other kinds of brownies, we recommend the website(ALLRECIPES), you can find many other recipes on it. Sujude brownie pans are made of xynflon coating, easy to strip and clean, non-falling, in line with the EU LFGB and the USA FDA food-grade standards. 1.Are brownies your favorite desert? 2.Do you hate to cut brownie? 3.Do your children fight for the bigger brownie? 4.Do you want to let your guy scream with excitement when he/she opens it up on some special days? 5.Do you want to impress others by using a simple brownie pan on wedding, birthday party for your family, workmates, boyfriends/girlfriends or even you are running a coffee shop? SO WHY NOT BUY IT? 1.Meet any problems during your using, contact us first, we will reply you within 8 hours, and serve you the best. 2.We will send you the instructions and recipe via email, if you do not receive, pls contact us. 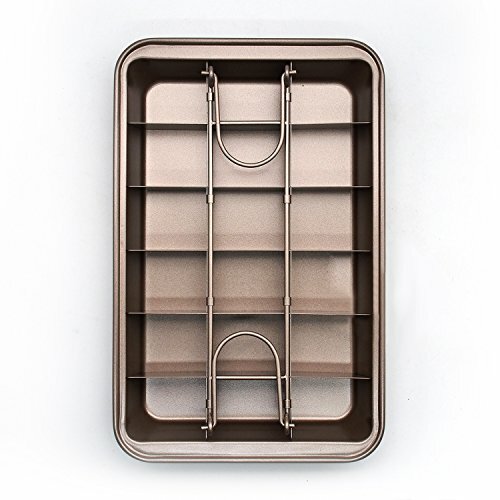 [HIGH QUALITY] The Brownie Pan & Divider are made from aluminized steel for superior heat conduction and even baking. [WIDE USAGE] Makes brownies, lemon bars, and other similar desserts; As a gift for your family, friends, and anyone who want to bake, make the perfect brownies and present them at a bake sale, church event, a girl's slumber party, holiday parities, and to friends visiting or anything as a snack. [EASY TO USE] Perfect design, easy to clean, even the divider; perfect release, non-stick coating for ease of baking and cleanup. Makes 18 perfectly sliced brownies; creates flawless and uniformly sized brownies. [ADVICE] Please check the size carefully! Spraying the pan and divider with cooking spray will make your baking easier to remove from the pan. please read the production description carefully. [GUARANTEED] GUARANTEED SATISFACTION or WE'LL SEND YOUR MONEY BACK. If you have any questions about this product by SUJUDE, contact us by completing and submitting the form below. If you are looking for a specif part number, please include it with your message.